This first public data release of KiDS is based on the first 50 tiles that were observed in all 4 filters (u,g,r,i), during the first year of survey operations (15 October 2011 to 30 September 2012). The locations of these 50 tiles on the sky are indicated in the figure below. For a table with the coordinates of the tile centers please refer to the data table on this website. 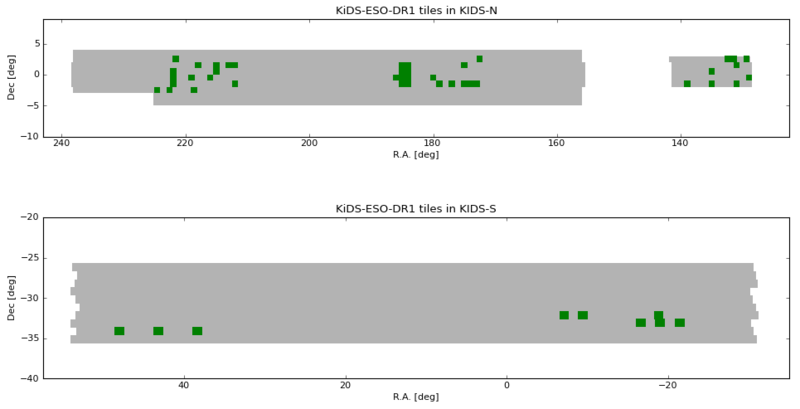 Location of the 50 KiDS-ESO-DR1 tiles; the two KiDS fields (top: KiDS-North; bottom: KiDS-South) are outlined in gray, with the tiles included in this data release in green. A total of 800 files is included in the official data release: per tile for each filter a Coadd, a corresponding weight frame, a mask FLAG image, and a source list; the total data volume is 702 GB. Via this website, additional source lists (using different source detection parameters) and inspection plots are accessible. For example: the r-band stacked image of the tile “KIDS_48.3-33.1” is called KiDS_DR1.0_48.3_-33.1_r_sci.fits.